GIVE THE GUY A BOOST! The galaxy is populated by all sorts of cool critters, some with crazy advantages and others with a few obstacles in their way. Fortunately, the underdogs are usually cute enough that they can get a bit of a hand in overcoming their problems. You wouldn't want to help a sarlacc accomplish anything, but these adorable porgs and their limited mobility on Ahch-To immediately make us want to do all we can to help them get an upper edge on all their aspirations. Plus, it never hurts to have a second set of eyes looking out for trouble! Give a porg a shoulder to sit on and ensure that you've got a cute companion with you at all times! This Porg Shoulder Sitter is the perfect way to bring a little Star Wars: Episode 8 fun into your life without having to travel a couple galaxies over. This stuffed version of a digitally altered puffin has all the looks of the animals that waddled into our hearts from the fuzzy white belly to the giant adorable eyes. 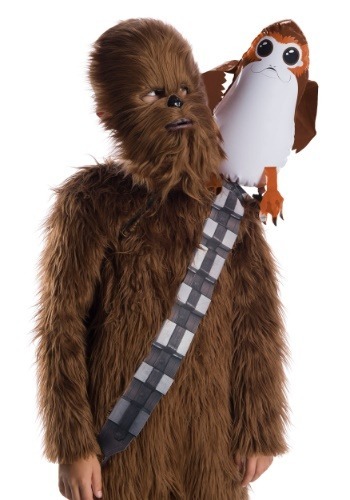 No matter what your lot in life may be, this Porg companion will make any look you strike all the better. From costume party antics to business suit inquisitions, no one can say no to these eyes! Who can deny the power of the porg! ?